Legacy testing exposes your business to incalculable risk. Functionize’s AI removes test churn, increasing the accuracy and efficiency of testers. Turn testing into a competitive advantage when it matters, accelerating and nailing your GTM. Dramatically reduce time to market – slash the time taken for test creation, maintenance, and analysis. No more maintaining test infrastructure. Seamless CI/CD integration. One day we had restyled a page pretty drastically. The head of QA came to me and said she couldn’t believe it! None of the tests had failed. Before Functionize, our Quality Engineers had to rely on our DevOps and backend engineers to perform their work. Now with Functionize, they can not only serve more engineers and cover more parts of the product, but they can also perform their job without the help of other teams. With Functionize, I spend almost no time manually maintaining our test suites. 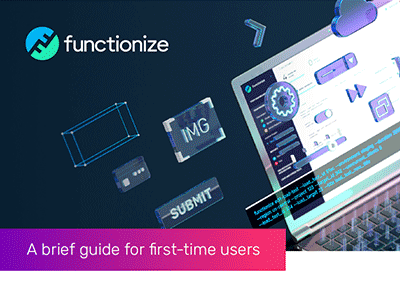 Functionize delivers the first autonomous, AI cloud-based testing platform. This guide will help you get started. Discover how Functionize has improved QA efficiency by 600% for TOTVS, the largest enterprise software house in Latin America. The Functionize platform is powered by our Adaptive Event Analysis™ technology which incorporates self-learning algorithms and machine learning in a cloud-based solution. For more information, read our blog, follow us @functionize or email us to learn how you can get started today with Functionize Autonomous Testing. We may collect information related to the use of our websites, such as “cookies” or other similar technology or practices, in order to better understand our customers’ needs. A “cookie” is a small text file that a web server places on your computer hard drive that includes a unique identifier. Cookies enable Funcitonize to track usage patterns and deliver customized content to users. We may also use web bugs, clear gifs and similar technologies that collect data similar to that collected by a cookie. If you do not want your information to be stored by cookies, you can configure your browser so that it always rejects cookies or asks you whether you want to accept cookies prior to proceeding. Please note that rejecting cookies may reduce the performance and functionality of our websites.